Like anyone else in the teeming metropolis, Olaf spent the other night taking trains, meeting friends, and getting something to eat. What else do you expect him to do? Build a freakin' snowman? Obviously, this costume is for Halloween, which now gets a lengthy celebration in Japan (there were Halloween parades this past weekend, for example). 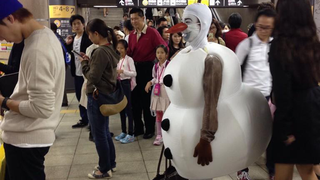 This Olaf was spotted in Tokyo's Shibuya last night, much to the delight of people in the streets and on the internet. Some of these photos were retweeted tens of thousands of times.